In short: Tubular exhaust manifold with equal length mandrel bent pipes and pulse-split style collector. Maximum flow for fastest possible spool-up and improved top end. Driveability improves over the entire rev range. For whom: Especially suitable for cars with larger turbochargers, where driveability is a priority. Details: Tubular exhaust manifold built from equal length mandrel bent stainless steel pipes, allowing quicker evacuation of exhaust gasses from the cylinders as well as separation of gas flow until reaching the collector, all resulting in a significant improvement in spool-up. Reduced back pressure also allows higher top-end when fine tuning boost and ignition maps. The end result is a very high degree of driveability even with very large turbochargers. 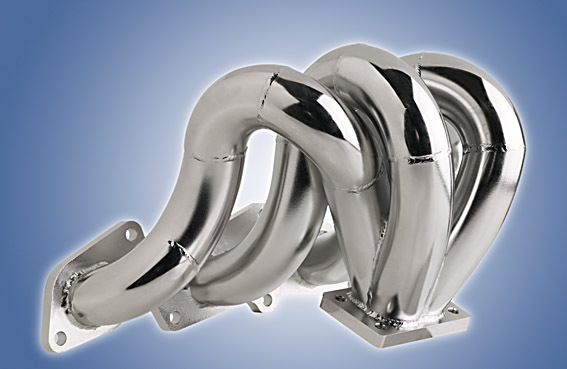 We strongly recommend combining this with a large downpipe to optimize flow all the way through. Manifold is delivered with a T25 turbo flange. The position of the turbo flange is moved compared to original. The original cooling fan must be replaced with a thinner one.